Thus, now one can directly access and transfer data, full length movies and songs to your swanky smartphones with ENRG-powered flash drive. 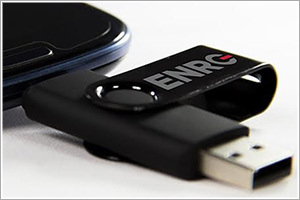 ENRG, the emerging business, dealing into light, sound and storage products has proudly announced the launch of their first OTG (On-The-Go) USB drives for android smartphones and tablets. These small mobile USB drives have a standard USB on one end and a micro-USB on the other end, so that they can be accessed directly from a computer or from any OTG supported android Smartphone or tablet. Thus, now one can directly access and transfer data, full length movies and songs to your swanky smartphones with ENRG-powered flash drive. Talking about its features, the USB drive has got excellent USB OTG (On-the-go) feature for smartphones. In addition, there is good news for music lovers as well, as it has plug and play feature which requires no additional software. Thus, there is no hassle of downloading the music from any other source. Besides, it is USB powered which means there is no requirement of external power supply or battery. In terms of reliability, it has got one year warranty with up to 10 years of data retention life. ENRG mobile USB Drives are compatible with all operating systems like Microsoft Windows XP or later, MAC OS 9.0 and Linux Kernel 2.4.2 or later. The Micro USB Port also goes well with all android smartphones and tablets. ENRG OTG USB drives are available in 16GB capacity and 1year warranty. Priced at Rs.999/- only, it is available at almost all the leading ecommerce websites.